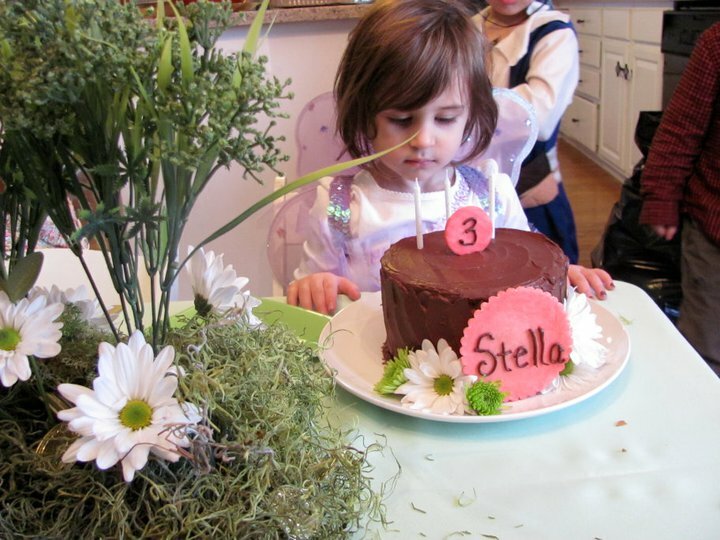 A few weekends ago we had a triple birthday celebration, for my nieces Stella and Georgia and my son Andrew. I was in charge of the cake and decided to make each child their own cake! I definitely knew that one of the cakes had to be chocolate. The pressure was on as I knew it had to be good enough to serve up a crowd of gluten eaters :) So after many attempts, I had finally reached my standards of a good chocolate cake. Moist, rich in flavor yet still light in texture. My dad, who is my honest taste tester, who tells it like it really is, could not believe this cake was gluten free. He was very pleased, and so was I! Don’t be confused by the coffee in this recipe, it only helps enhance the rich chocolate flavor and does NOT impart any coffee flavor whatsoever. Whisk together wet ingredients, except coffee. Add dry ingredients. Combine well. Pour into greased pans or cupcake tin lined with wrappers. Bake 20-25 minutes for cupcakes or until cake tests clean with toothpick. Remove from pans, cool completely before icing. 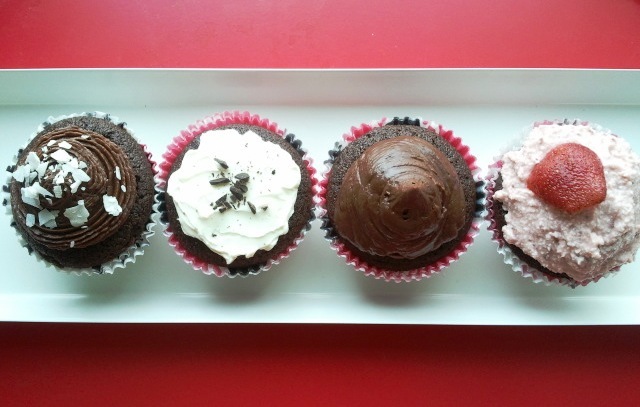 Pictured above: Chocolate Coconut Cream Frosting, Whipped Cream Cheese, Rich Chocolate Buttercream, Strawberry Buttercream. 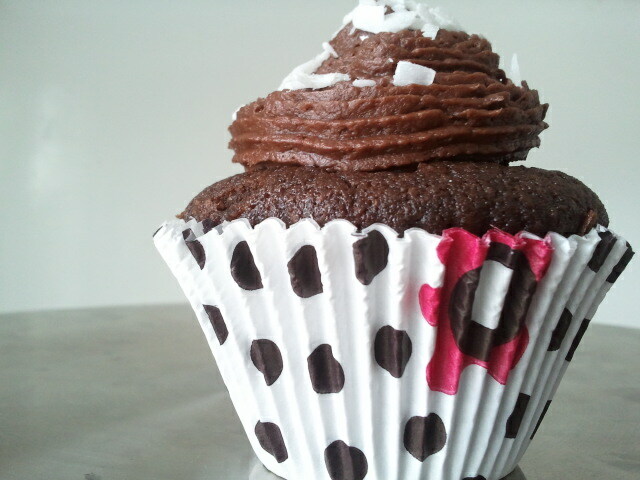 Be sure to check back tomorrow, I will be posting the Chocolate Coconut Cream Frosting! Looks delicious! Is this SCD? Really? We aren’t SCD anymore. More of a modified version allowing for rice and potato, but this looks great and we have all the ingredients in the pantry. I’ll wait for the chocolate coconut cream frosting recipe! What did you use for the cake’s decoration? I am so excited! I will have to make this and bring along with me to my birthday party this weekend. I love Chocolate Cake, and since gluten free is new, my family will be unprepared for me with cake. Your pictures make it look divine! Well, I now know that trying to follow a recipe when I’m sick and my brain isn’t processing very well isn’t a good idea. I thought my cake would be beyond redemption after prematurely pouring in the hot coffee, then scooping it out, followed by forgetting to add the eggs. When the batter was mixed together, my husband pointed out the eggs still on the counter. Whoops. After these great baking offenses, would it actually bake into anything edible? Fortunately, for my also-on-a-special-diet, grumpy 5 year-old it DID! It even has a nice flat top, which I would certainly appreciate if I was using frosting and decorating it. It’s chocolate, it’s really good and next time, I’ll make it when I’m coherent enough to follow the recipe correctly! I’m sure the texture will be AWESOME! And the coffee really does make it seem more chocolate-y, but there’s no coffee taste. Great recipe! Can’t wait to try it! I need to find a really yummy frosting with no dairy now. I have to say, this was even better the next day, if that’s possible! These are amazing! If you ever publish a book, I’ll certainly buy it! I have been recently diagnosed with Celiac Disease and this is the first cake that I made. I must tell you that it is the best chocolate cake that I have ever eaten. My husband loved it and so did my friends and family. Thank you so much for an easy recipe! Truly amazing. I am going to try the lemon cake next. Can I substitute the almond flour and eggs for something else?? This is my second time making this recipe in two weeks. I first made the cupcakes and now I made two 8 inch rounds as part of the birthday cake for my 4 year old tomorrow. The bottom layer will be a nine inch square of your yellow cake, now in progress. I’ll be covering it all with marshmallow fondant to make a Batman and Spiderman superhero cake. Your recipes are awesome, I’m a huge fan. As far as I know, no one in my family has food sensitivities but I am trying to reduce grains and avoid wheat. I do find my palate is super sensitive to honey (the one I currently have may be too strong tasting) so I use maple syrup with the chocolate cake and Lyle’s Golden Syrup (sugar cane) for the vanilla to get a more traditional sweet taste. It’s not as healthy as honey, but it makes the vanilla cake even less discernible from the wheat we are used to. First of all, I’m so glad I came across your blog on Pinterest. I’ve been gluten-free for a few years now, and my budget doesn’t allow me to splurge on too many pre-made gluten-free items (also, so many of them just don’t taste very good). I also love to dabble in cooking, so this is awesome. THANK YOU! Quick question for you: Do the chocolate cupcakes/cakes still taste amazing without the coffee? Coffee is actually on my allergen list too (along with cashews, which is a total bummer after seeing your alternative cream recipe)…is there a suitable substitute for bringing out the chocolate flavor? I, too, am a chocoholic. Welcome Jenny! Coffee is not key to the chocolate cake, just substitute hot water in its place and add good vanilla extract to enhance the chocolate flavor. Best wishes! Thanks, I just found your blog and am loving going through these recipes!!! You can absolutely omit the chocolate. I do not want you getting sick : / Just use hot water in its place. Glad you found my blog! Can I use trader joes almond meal for the almond flour? It’s not blanched. Ok, made them with the almond meal… Awesome! For All i know the flour is better, but I can’t see how because these were wonderful, texture still delicate and fluffy. I made a buttercream with cocoa, melted butter, vanilla, powdered sugar, and raw cream and its heavenly on them. I can’t wait to make them again. One more question, usually when a recipe makes a two layer 9in cake I feel like it makes 24 cupcakes. Are the layers super thin? This looks awesome! Going to try it for my son’s first bday. I’m wondering if you could substitute agave syrup for the honey? You can replace the honey with agave or maple syrup. Hope your son has an awesome first birthday! Hi Michelle! I am a newbie GFer! I am so glad I came across your site. I made the chocolate cupcakes as a cake today and I am blown away! Awesome! No one would know this is Gluten Free! I am excited to try many more of your recipes and have subscribed to your newsletter. I have been GF for about a week and my nagging cough due to post nasal drip is gone! My husband says it is a miracle! Thanks and keep the recipes coming! The best gluten free cupcakes I have ever made. Thank you for this recipe.